SMESHOPS collects personal and non-personal information when they register to gain access to the services provided by the SMESHOPS or at other specific instances when they are requested to provide us with their personal & non-personal information (“Information”). Personal Information shall include, but not limited to, information regarding Your name, date of birth, gender, address, telephone number, e-mail address, etc. You can always choose not to provide information and in such cases, if the information required is classified as mandatory, You will not be able to avail of that part of the Services, features or content. You can add or update Your Personal Information on a regular basis. When You update information, SMESHOPS will keep a copy of the prior version for its records. SMESHOPS's primary goal in collecting information is to provide the user with a customized experience on our websites. This includes personalized services, interactive communication and other services. SMESHOPS collects Your Personal Information in order to record, support and facilitate Your participation in the activities You select, track Your preferences, to notify You of any updated information and new activities and other related functions offered by SMESHOPS, keep You informed about latest content available on the Website, special offers, and other products and services of SMESHOPS, to provide You with a customized Website experience, to assist You with customer service or technical support issues, to follow up with You after Your visit, to otherwise support Your relationship with SMESHOPS or to prevent fraud and unlawful use. Certain information may be collected when you visit the Website and such information may be stored in server logs in the form of data. Through this Data SMESHOPS understand the use and number of user visiting the Website. Some or all data collected may be shared with the sponsors, investors, advertisers, developer, strategic business partners of SMESHOPS. While using the Website, SMESHOPS's servers (hosted by a third party service provider) may collect information indirectly and automatically about Your activities on the Website; for instance by way of cookies. Promotions that run on our website may be sponsored by companies other than SMESHOPS or may be co-sponsored by SMESHOPS and another company. We use third-party service providers to serve ads on our behalf across the internet and sometimes on the Website. They may collect information about Your visits to our Website. SMESHOPS uses the log file which includes but not limited to internet protocol (IP) addresses, browser software, number of clicks, number of unique visitors, internet service provider, exit/referring pages, type of platform, date/time stamp, screen resolution etc. for analysis that helps us provide you improved user experience and services. We use them to administer the site, track a user's movement and gather broad demographic information for aggregate use. Once a user registers, he/she is no longer anonymous to SMESHOPS and it is deemed that the user has given SMESHOPS the right to use the personal & non personal information. Business information is used to display the user's business listing or product offerings across our website to fetch maximum business opportunities for the user. If You upload any content on the Website and the same may be available to the other users of the Website. SMESHOPS will not be liable for the disclosure and dissemination of such content to any third parties. Once the user's content is displayed on our website, the user may start receiving business enquiries through email, phone calls or SMS notifications, from third parties that might or might not be of their interest, SMESHOPS does not exercise any control over it. SMESHOPS may, if You so choose, send direct advertisement mailers to You at the address given by You which could contain details of the products or services displayed on SMESHOPS or of any third party not associated with SMESHOPS. You have the option to opt-out of this direct or third party mailer by clicking at the unsubscribed link option attached to e-mail. SMESHOPS respects Your privacy and if You do not want to receive e-mail or other communications from SMESHOPS. In situations when SMESHOPS is legally obligated to disclose information to the government or other third parties, SMESHOPS will do so. As a general rule, SMESHOPS will not disclose or share any of the user's personally identifiable information except when SMESHOPS has the user's permission or under special circumstances, such as when SMESHOPS believes in good faith that the law requires it or as permitted in terms of this policy. SMESHOPS may also disclose account information in special cases when SMESHOPS has reasons to believe that disclosing this information is necessary to identify, contact or bring legal action against someone who may be violating SMESHOPS 's Terms of Services or may be causing injury to or interference with (either intentionally or unintentionally) SMESHOPS 's rights or property, other SMESHOPS website users, or if SMESHOPS deems it necessary to maintain, service, and improve its products and services. Personal information collected may be transferred and shared in the event of a sale. You are required to submit Your information at the time of making an online purchase on the Website. SMESHOPS uses an online payment gateway that is operated by a third party and the information that You share with SMESHOPS is transferred and shared with such third party payment gateway operator. The said operator may also have access to Your online purchase history/details that You make from the Website. Extremely sensitive information like Your credit-card details are transacted upon secure sites of approved payment gateways which are digitally under encryption, thereby providing the highest possible degree of care as per current technology. You are advised, however, that internet technology is not 100% safe and You should exercise discretion on using the same. Links to third party sites are provided by website as a convenience to user(s) and SMESHOPS has not have any control over such sites i.e. content and resources provided by them. SMESHOPS may allow user(s) access to content, products or services offered by third parties through hyperlinks (in the form of word link, banners, channels or otherwise) to such Third Party's web site. You are cautioned to read such sites' terms and conditions and/or privacy policies before using such sites in order to be aware of the terms and conditions of your use of such sites. SMESHOPS believes that user(s) acknowledge that SMESHOPS has no control over such third party's site, does not monitor such sites, and SMESHOPS shall not be responsible or liable to anyone for such third party site, or any content, products or services made available on such a site. SMESHOPS takes necessary steps, within its limits of commercial viability and necessity, to ensure that the user's information is treated securely. Unfortunately, no data transmission over the Internet can be guaranteed to be 100% secure. As a result, while SMESHOPS strives to protect the user's personal & business information, it cannot ensure the security of any information transmitted to SMESHOPS and you do so at your own risk. Once SMESHOPS receives your transmission, it makes best efforts to ensure its security in its systems. Please keep in mind that whenever you post personal & business information online, that is accessible to the public, you may receive unsolicited messages from other parties. SMESHOPS is not responsible for any breach of security or for any actions of any third parties that receive Your Information. The website is also linked to many other sites and we are not/shall be not responsible for their privacy policies or practices as it is beyond our control. 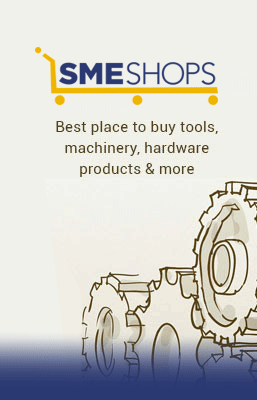 SMESHOPS may, from time to time, send its users emails regarding its products and services. SMESHOPS constantly tries and improves the website for better efficiency, more relevancy, innovative business matchmaking and better personal preferences. SMESHOPS may allow direct mails using its own scripts (without disclosing the email address) with respect/pertaining to the products and services of third parties that it feels may be of interest to the user or if the user has shown interest in the same.